SACRAMENTO, CA (September 2, 2018) - 37-year-old Matt Cohn (San Francisco, Calif.) shot a 3-under 69 to take a one-shot lead with one round to go at the 94th California State Fair Amateur. Low numbers were a little harder to come by in the second round at the Alister Mackenzie Golf Course at the Haggin Oaks Golf Complex. First-round leader Lucas Carper (San Jose, Calif.) shot a 9-under 63 on Saturday, and Cohn had a 65, but on Sunday there were no scores below the 66 shot by Matt Lutz (Placentia, Calif.). Cohn, the reigning NCGA Mid-Amateur champion, had five birdies and two bogeys to get to 10 under par through two rounds. Carper cooled off after his opening 63, dropping three shots early but rebounding to get it back to even for the day and 9 under for the tournament. He is tied with U.S. Amateur runner-up Devon Bling (Ridgecrest, Calif.), who matched Cohn's 69 after a 66 on Saturday. Bling, playing in the second group of the morning, started fast with three birdies in his first five holes, before dropping two shots by the turn. He then made all pars until a walk-off eagle at the par-five 18th. Lutz moved into a tie for fourth at 8 under, two shots behind, with Finigan Tilly (San Carlos, Calif.) who shot 67. Two-time champion Robert Hamilton (El Dorado Hills, Calif.) started the day in third after a 66 on Saturday, but stumbled to a 75 that leaves him in a tie for 23rd at 3 under. Scoring continues to be good, with all 42 players making the cut in red numbers. The cut fell at 1-under 143. In the other State Fair events, Abegail Arevalo took the Women's Division by seven shots, while John Jaramillo won the Senior Division, Mark Maltzer won the Super Senior Division, and Arron Goodin won the Net Division. Ryan Sloane (Camarillo, Calif.) is in position for what would be an incredible fifth straight Masters Division title, taking a two-shot lead into Monday's final round. 17-year-old Lucas Carper (San Jose, Calif.) shot a 9-under 63 to take a two-shot lead after the first round of the 94th California State Fair Amateur at the Alister Mackenzie Golf Course at the Haggin Oaks Golf Complex. The UC-Davis commit went bogey free, starting off modestly with a birdie and six pars before catching fire, going eight under on his last 11 holes. He played the two closing par fives on the back nine birdie-eagle (he started on the 10th) to turn four under, then played the front nine in 5-under 30, with birdies on four of his last five holes. Mid-amateur Matt Cohn (San Francisco, Calif.) rode a back-nine 29 to finish in second place with a 65. The 29 was even more impressive considering it came on the back nine, which has a par of 37. Cohn, who won the Northern California Mid-Amateur earlier this summer, was one over through ten holes but played his last eight holes in eight under. Devon Bling, who finished runner-up in the U.S. Amateur at Pebble Beach two weeks ago, shot a 66 to share third with two-time State Fair champion Robert Hamilton. The 41-year-old Hamilton won back-to-back titles in 2000 and 2001. 25 players shot in the 60s on Saturday, with a group of five at 67, eight at 68, and eight more at 69. In all, 59 players broke par in the first round. Round two tees off on Sunday, with the final round on Labor Day Monday. In other State Fair events, Steve Wilson (Antioch, Calif.) leads the Senior Division after a 6-under 66 at Mather Golf Course. Greg Durst (Sacramento, Calif.) and Ron Johnson (Walnut Creek, Calif.) lead the Super Senior Division with rounds of 72. In the Masters Division, Ryan Sloane (Campbell, Calif.) is trying to win his fifth State Fair in succession, and he is off to a good start, taking the lead with a 67 at Bing Maloney GC. Santa Clara University junior Marni Murez (Manhattan Beach, Calif.) leads the Women's Division after a 69 at Bartley Cavanaugh GC. 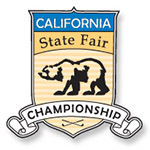 The State Fair Men's Amateur Championship is one of the oldest and most prestigious Amateur Championships in the West. The Championship is limited to 156 players. Competition commences over a 54-hole stroke play format with 18 holes played each day. The field is cut after 36 holes to the low 45 players & ties.